It was necessary to provide 80,000 gpd of wastewater treatment for a new commercial development and cricket stands associated with the International Airport at Antigua, West Indies. The site available for the treatment facility is clearly visible from the airport terminal, and is immediately upwind of the client’s prestigious international banking center. 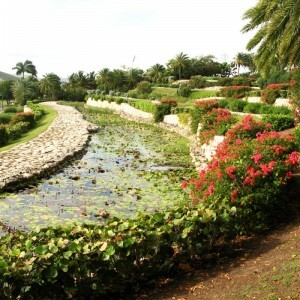 It was desired to use the effluent for irri­gation. These constraints required a treatment facility that would produce a consistently high quality effluent suitable for irrigation, would have pleasing aesthetics, quite operation, and zero odor.